Search no more! Magic Baby willl fullfill your doll needs, or your money back. Garanteed!! Just in time for the Holidays! Buy your Forest Elf Collection here, D'Anton Jos Rotten Kids, The Gorditas, plus many more, We carry famous brands such as Jesmar, Toyse, Magic Baby, D'Anton Jos, Mariquita Perez, Arias, Marin. Our non-European Collection, Adora Dolls, Applause, Ashton Drake, Ashley Belle, Lee Middleton, Precious Moments. Please come in. We are now open for business in the Internet. D'Anton Jos "Maja" Collection are limited to 300 dolls made worldwide. With life like expressions, and vinyl that looks very much like porcelain, these dolls come with rooted hair and hand applied eyelashes. Each measures 22" h and comes new in box with Certificate of Authenticity. 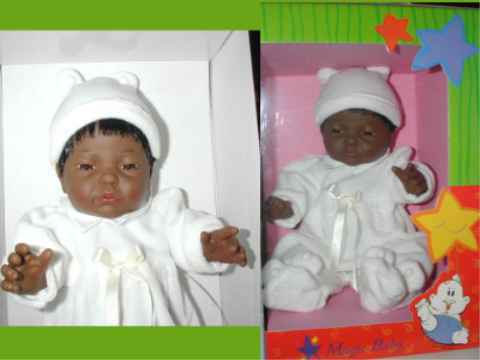 Our Spanish Black dolls are rare and unique, Our line varies from Collection dolls to play dolls. Gorgeous Babies from Spain. Our Line of Babies are from many different brands. Jesmar, Toyse, D'Anton Jos, Magic Baby, and even some are from our non-European Catalog.